How cool are these hanging, mixed metal address plaques with a place for succulents?! We're in love. They're from the UrbanMettle shop on Etsy. She has a bunch of different options, so be sure to make it to her page! This is a fantastic greeter when you unlock your door into happiness. A simple and easy reminder that happy starts at home. Want to spend the evening outside? Snuggle up with one of these Alpaca Throws from the Peruvian Andes! The vibrant colors can be seen all throughout the different collections at Koko. Bright colors will help you unlock your happy this spring. Oxgut Hose Co. - Upcycling Fire Hoses! For all you firefighter lovers out there, you're going to love these! I had the greatest pleasure of meeting the inspiration behind Oxgut Hose Co. There's nothing like the excitement of stumbling upon unique finds, especially ones that are helping our environment and promoting happiness. What drives Oxgut is keeping old fire hoses out of landfills and creating exclusive designs with a heroic past. Just as much as they love finding new life for fire hoses, they love honoring its original purpose: saving lives. A portion of their profits go directly to The Children's Burn Foundation. Simple. Unique. Brilliant. I am inspired! There is nothing better than the smell for fresh herbs drying in a crackling warm house! We're all for the fresh herb garden planted in the Spring, but if you don't want to wait, go to your local market and pick up your favorite herbs. 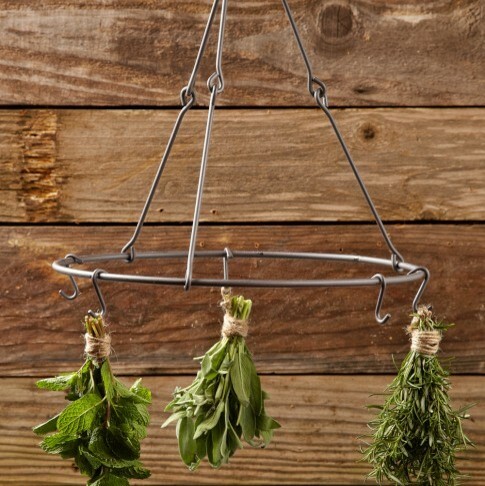 Then pick up this nifty drying rack from Williams-Sonoma and add a touch of spring to the winter blues. Feeling Festive for St. Patty's Day! St. Patrick's Day is around the corner! Add some holiday fun to your front door. This boxwood wreath not only dresses up your house for St. Patty's Day but is also a great introduction to Spring! Check out this reef at Always Bloomin Designs on Etsy! WE LOVE BUDDHAS! We both have buddhas scattered around the house and in our gardens. We're always looking for unique buddhas, not the typical ones you see in Lowe's or Home Depot...VivaTerra is a one-of-a-kind company that finds those special artisans and take creative design to another level. VivaTerra believes that you don't have to compromise style to help preserve the earth's precious resources. Today is one of my favorite days of the year, I am such a sucker for "love." I am totally in love with love (my friends who know me, don't laugh out loud). I have always been the girl that draws the little heart by my name. It's my gig and I LOVE it! So, with that said, how about sprucing up your outdoor space with a little valentine love? I've got the perfect thing, a purple heart! It's totally me, but I'm thinkin' you might like it too. Functional art makes your outdoor space come alive! Check out this Bird Cafe, a modern feeder for your feathered friends, from Terra Trellis. The Bird Cafe together with the Akoris Garden Tuteur provide a garden eco-system that is sure to liven' up your garden. The Bird Cafe can also be purchased separately and screwed onto a common wooden post. A modern/rustic habitat the hippest birds will tweet about! This one shown has a natural steel oxide finish, but check out all these vibrant colors your can choose from! You don’t have to feel like you must live on the beach to decorate your outdoors with teal anymore... It is now safe to bust out this spring's HOT color everywhere! Teal is taking over. Whether you choose bold painted furniture or just accent your table with the bright color, teal adds the magic to any outdoor space. We clearly love it! ©2019 Unlock Home. All Rights Reserved.